I can't believe it's already Thanksgiving & already time to start thinking about the holidays! I've know some people jump right into the Christmas spirit (there were Christmas carols on the radio a few days ago!) but my favorite holiday is Thanksgiving so I'm taking these holidays one at a time, starting with a casual outfit idea for Turkey Day. I'll be sharing a dressier outfit idea for Thanksgiving soon, but in the meantime, I'm curious: what does your ideal Thanksgiving outfit look like? Michelle, seriously this vest is everything! I absolutely love it and your entire Thanksgiving Day look! 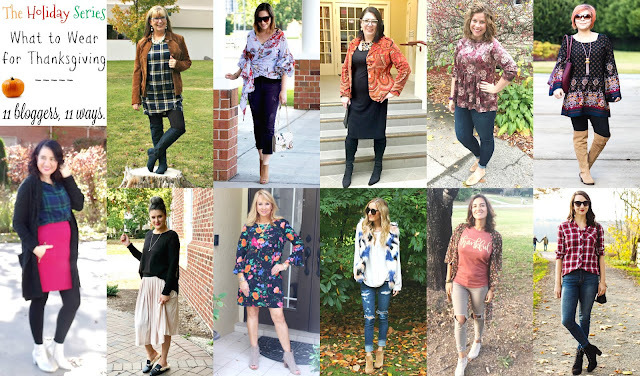 Another fun collaboration with all of you fabulously stylish ladies! It was! So excited for the rest of them! I cannot wait to see your dressier Thanksgiving outfit too and all the other fun posts we have coming up. Thank you for being a part of this one, once again dear Michelle. Check out my post, below. My dressy Thanksgiving look will be up next week! Love this unique vest! The color palette is gorgeous with the subtle neutrals contrasted perfectly with the bright blue! I love that fur vest! The blue and pink faux fur is an unexpected color combo for thanksgiving and I love it! It is such a fun piece! Different than anything else I have in my closet. You are such a STUNNER!!!! Love your fur vest doll. Perfection! Thanksgiving is my favorite holiday, too. This vest is so fun and fabulous! Fantastic holiday look. It's always such a fun family day! You are so right! Definitely don't want to ruin this faux fur! I love the vest! Lovely colors! This is easily one of the cutest and comfiest vests I've seen dear. I love it, it's fab and functional at the same time. Fur vests are the funnest things around, and this one is perfect!!! Nice outfit for outing I really like it willing to try it as soon as possible.